A couple of weeks ago I mentioned that the cats have lately become very lap-oriented right after dinner, and this has had a side effect: Marian has become quite attached to taking pictures of me buried under cats. So here’s the latest. 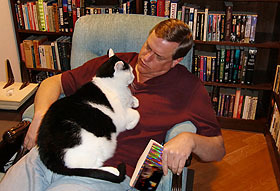 On the left, I’m slouched low in my reading chair so that Inkblot can settle comfortably on my stomach while I try to read. Sometimes I can, sometimes I can’t. 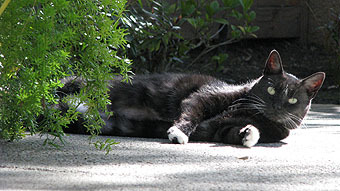 On the right, Domino is showing off her less intellectual side, rolling around in the sun on the back patio. One way or another, though, everyone’s happy.